Dan Kaseler has a wealth of sail designing experience, spanning decades. From humble beginnings at a Seattle sail loft, to working with some of the biggest companies in the game (Neil Pryde/Naish/Gaastra/Vandal), Dan now heads up his own brand, Avanti Sails. We caught up with Dan as he and the team prepare for 2017’s coming season. Grab a cuppa, put your feet up and delve into Avanti’s world. 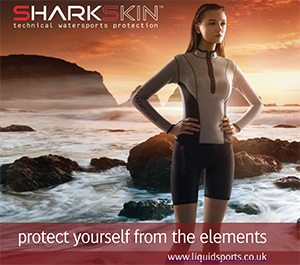 Firstly give us a bit of background – how did you get into windsurfing and what eventually led you into sail design? It starts with my parents. They were the ones who got me stoked on sailing, and I spent my summers racing small boats. It wasn’t our only activity but it was for sure a family affair. By the time I was off to engineering school in 1991 my love of sport was equally divided between skiing, boat racing and windsurfing. Of the three activities it was windsurfing that I discovered on my own. In a sense I had found a new boat…that you could jump. My first job sail making was not glamorous. I basically swept up the floor and cut Dacron triangles for corner patches at the local Neil Pryde loft in Seattle, then later at the North and Shore lofts. During summers I would hobble my derelict Volkswagen bus down to the Gorge, live in it, and ride my bike back an forth across the Hood River bridge to repair windsurf sails. I worked for Rushwind and Hurricane. Rushwind at the time had the first Carlson plotter/cutter and I jumped in the game right around the time that Monofilm was taking off. Nik Baker and Luke Hargreaves were the team riders and I had front row seats of Dave Russell and his team building extraordinary sails for the World Cup. Following a nasty femur break in a snowboard accident in early 1997 I chased my dream to Maui, where I was able to convince Don Montague and Robby to give me a job at Naish. 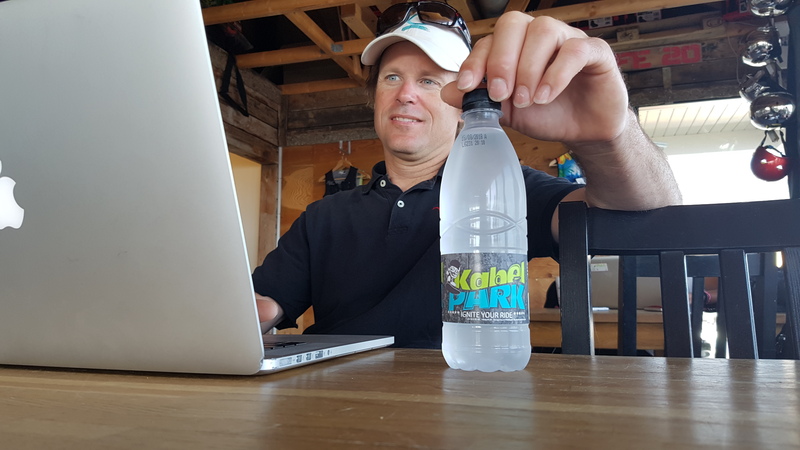 I learned an enormous amount working and collaborating on the windsurf product, the speed records, and the birth and rapid development of early kiteboarding. Our emphasis on software development and the systems we built to improve production quality are still benchmarks. Those were very creative years, with everything from kites, boxer style stuff and inflatable wing sails. In 2005 I moved over to Gaastra where I had a six year run as the head of the windsurf R&D. Product development was straight forward, and year over year, we did well to increase market share. There wasn’t as much room to think out of the box. One of the more notable outlets was the creation of the Vandal brand, which originally brought a nugget of skate culture back to windsurfing. Talk to us about Avanti Sails – where did the idea for a windsurf sail brand come from and what did you want to do differently when setting the company up? With Avanti the technology came first and the brand followed. In boats I was competing on strung membranes and I became super interested in finding a way to port the technology over to windsurfing – essentially miniaturizing it and making it viable for mass production. It was super obvious that it was a superior approach to sail making. My first membrane was a one-off prototype for my home-made foiling Moth dinghy. It was so lightweight and durable, it was only a couple weeks later and I was straight into a 9.4m windsurf race sail. That was Avanti sail #1. Avanti is a ‘products first’ company. We set it up that way at the start. The idea was to build the best sails we could, while worrying about costings and marketing second. This is opposite to the norm. We are working on high-end products where most of the industry is trying to out-discount one another. It’s like a race to the bottom. On the other hand, our commitment to quality is a challenging approach, but we know, if we build something the right way customers will come. In the end we’ve been able get the price down to a reasonable level. How has sail design changed over the last few years? After all, there can only be so much innovation within this area, right? Or is it always evolving? Sail making is always evolving. It’s relentless, and if you look away you can get left behind. There is no question that shapes industry-wide have changed dramatically over the last years. Here at Avanti we borrow inspiration from all kinds of sources – from kite shapes, to America’s Cup profiles, to competitor’s designs. With aerodynamics and flow systems we are all still scratching the surface of what is possible. And what about materials? Is this the biggest area for windsurf sail innovation? Which materials do you incorporate into Avanti sails and why? The strength of our membranes comes from the fibres we chose to string. Our primary high-performance fibres are Twaron and Technora, close cousins of Kevlar. Both these very similar aramids are made by Teijin in Japan and exhibit incredible strength to weight ratios. We sandwich these fibres between Mylar films which serve to hold them in their orientation. In terms of on water performance what will sailor benefits be with the sails you design and manufacture? How would you persuade sailors with older gear to invest in new for instance? Lighter Weight. More durable. Less deformation. Better reaction. The best advertisement is to sail one. Is it only the actual sail you look at or are you concentrating on the bigger picture with masts and booms as well? We know a sail’s associated components should all work in harmony – how important is it for sailors to pair up these elements properly? Matching your mast to your sail is crucially important if you want to get top performance. Your mast’s flex and bend curve are imperative to getting the most out of your sail, regardless of brand. I would encourage everybody to get the right mast to go with their sail. For booms and bases you need something stiff and light but I don’t find it nearly as important to remain in one ecosystem on those secondary components. When designing a new sail where do you start and why? How long does the process then take from beginning to end and how many prototypes do you go through before nailing the final product? In one sense, for me, the new sails we just launched were started back in 1992. We work and work and work, everyday looking for a little addition, or a little gain. At some point they ring the bell and we take what’s in our hands and release it to production. Perhaps that’s an oversimplification, but truthfully, the process really never stops. Do you rely on the Avanti Sails team for testing feedback or do you do it yourself? We will take information from anywhere we can get it. Avanti loves ideas and our culture is to encourage feedback. For sure, important information comes from the team riders. There is no doubt there. It also comes from the salesman. It comes from the shops. It comes from our production teams at the factory level and it comes from our customers. If you have feedback we want to hear it. Is Avanti Sails a brand that tweaks constantly or completely re-designs each season? What approach do you think is best for the consumer? We are a little unique in that our sails run for a two-year cycle. This is good for us and good for our customers. The Machine World Cup race sail is the exception, as we launch that one annually. In our general development model we have time to make sure each range gets meaningful updates every two seasons. This allows us to really focus our energy and get in depth on one sail range at a time. What about windsurf board performance? Do you design sails to cover as broad a range as possible or do you take a specific board shape and design around that? Race boards have been showing quite dramatic differences in rockers. We took a pretty good look at this when we were working on the M-5. Our sails need to apply to a wide range of boards, from Starboard, which rides more nose up, to Patrik boards, which tend to have a straighter rocker. There are other parallels in the wave and freestyle sectors. We consider this stuff for sure but we err on the side of cross-compatibility any time we can. Riders have always been advised to (where possible) use the same sails across their whole quiver. Is this still a relevant point for maintaining consistency of feel? What are the downsides of using a selection of kit? Obviously there is some value in having consistency across one’s quiver, if nothing else for familiarity of feel. That said this is a pretty unusual scenario for most real world windsurfers. I see people tending to replace key sizes more regularly, and after time, their quivers tend to be a bit of a mix. With our membranes getting broader ranges, and durability at and all-time high, perhaps we will see a shift in this direction. Talk to us about the cost of windsurfing equipment these days – do you feel, in general, gear is expensive? If yes, how do you think we get over this obstacle? I think there is a misconception about cost of entry. Windsurfing doesn’t have to be expensive. My first kit was all hand-me-down, or bought on the cheap at the second-hand store. I lived in my car, rode a rusty ten-speed bike to work, and taught myself how to gybe. This is just as possible now, as it ever was. As each of us starts to step up our game we want products that work well and enhance our experience. That’s where customers all make their own decisions. At Avanti we focus on value. Our products are not cheap, but when you buy an Avanti sail you are getting a lighter, more durable product with a longer life expectancy. 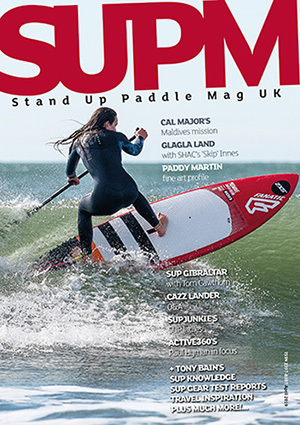 Some windsurfers suggest the sport should be marketed more like cycling, as in a rounded sport that doesn’t have to be as extreme as many media outlets make it to be. Do you agree with this? Could that be a way to attract larger numbers of windsurfing participants? No. I’m going off script on this one. This is the complete wrong direction. Almost everybody has been making the argument since the late nineties that we need more recreational gear, more focus on beginner product, and more watered-down marketing. This path has been explored ad nausea-um for over fifteen years without measurable benefit. The fresh thinking is that rather re-invent the wheel, take a look at nearly every other solo sport, from surf to ski, and make note that growth has occurred when brands re-focused on the edginess that made it cool in the first place. Skiing was re-born due to the Canadian Air Force and the advent of the twin tip. Surf exploded when people started seeing posters of Slater deep in the pit on the walls of shoe stores at their local malls. I can’t think of an example in our solo sport niche where diluting the messaging or making a glut of beginner products got things rolling. I say: push what’s cool and the rest will follow. Which sector of windsurfing do you see as having the most potential for growth and why? Is this a trick question? Hydrofoiling. Duh! Foiling has a ton of energy behind it, and it’s super fun, especially in light air. Currently there are a number of windsurfing brands that have sprung up within Europe such as Avanti Sails. There must be a sense of optimism surrounding the sport otherwise this wouldn’t have happened. Do you agree with this? I can’t speak for the other brands. Avanti sprung up because we love to windsurf and we believed we had something very cool to offer the market. 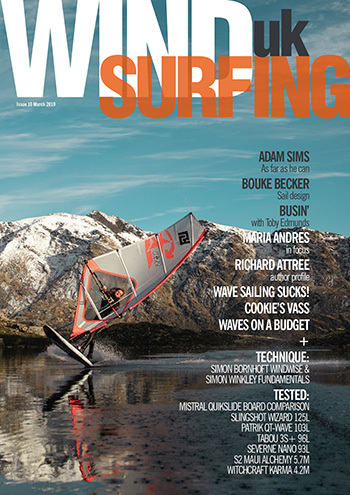 Where do you see windsurfing going during the next few years? Foils are being given a big push, for instance. But what else do you think could spark further interest? For sure you will start to see more and more engineered sail skins and membranes. We have a big head start, but the other brands are all getting involved because everyone recognises it’s the way forward. To compliment what we have inline we are taking a hard look at some of the components now, from battens, to new construction methods for reinforcements. It was huge to get a quality Aloha Classic on the books this fall, and the images coming out of that event should spark more interest in our great sport. On the other side, the industry is seeing some grassroots energy surrounding a re-emergence of longboard sailing and racing which is also a healthy turn of events. Altogether I’d love to see a paradigm shift with a captive kite rig, or something completely ground-breaking, but I think for the near future variations of foiling and related ideas are due to dominate centre stage. Any final comments on windsurfing in general or sail design? If you have a chance, jump on one of our sails and give us a holler to let us know what you think!